We are engaged in providing a comprehensive collection of Anodized Metal Labels which can be designed in various colors and designs as per the client's requirements. These labels are designed for fans, generators,energy meters starter, electric motors & electronic products. Also, the range is highly appreciated by our clients for its corrosion resistivity and durability. We are one of the renowned manufacturers and suppliers of Name Plate for Electric Panel. 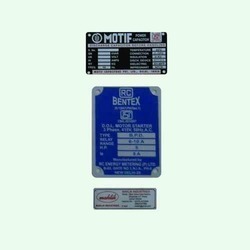 A label is a brief detail about a product such as model number, place and name of manufacturers, precautionary details. 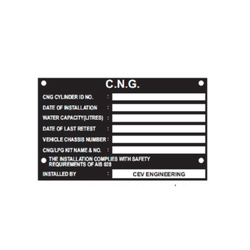 Almost all panel industries have labels that essential consist of precautionary notes. Our range of Powder Coated Printed Label is offered in innovative and creative designs as per the varied needs of the clients. 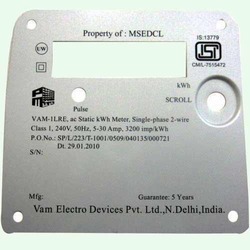 We provide an exclusive range of Energy Meter Plates Label, designed with superior quality metals. These are also used in Electric Fans, electric motors starters. Energy Meter Plates are known for features like corrosion resistant finish and rough surface design. We are engaged in offering wide range of Logos Label that are designed as per the specific needs of the clients. Our range of logos are available in animated as well as well as graphics forms. These are available in different attractive colors in order to make the logo presentation more attractive. We have catering to the needs of our various esteemed clients. We are one of the reputed manufacturers and suppliers of General Printed Plates that are designed for various applications such as road pillars to indicate the distance of the locations and in Home appliances, Electric Motors, Engine & other applications. Our general plates are extensively used in Factories, Shops, Public Places, Amusement Centers and other places. These are manufactured using optimum grade material and in conformity to the international quality standards. We manufacture single phase press fit type Energy Meter Name Plate with integral seal. These meter boxes are known for their durability and can withstand temperature conditions.